As I make my way to the Baale’s house, I am greeted every few steps by young and mature residents; obviously an in-built habit with folks on the island. I respond to each greeting, smile for smile, taking it all in my stride. Shortly, I stop over at a laundry shop to get a description to the Baale’s compound, and the young man I meet oozes such friendliness I wish to continue my conversation with him. Done with answering my queries, his parting statement leaves me tongue-tied. ‘I would have loved to take you there myself, but I am the only one in the shop. I’m sorry’. Walking away I ponder his generosity, considering I am a stranger. Down the road, I reach a spot where I find another young man seated on a mat, surrounded by neighbours; a partly eaten loaf of bread in his hand. I ask him if I am on the right path to the Baale’s house. ‘Yes. Just walk straight down’, he says, pointing with his left hand. ‘It is the biggest house you will see on your left, just before the railway line. You can’t miss it’. As I make to leave, he offers me a coconut with a broad smile. No doubt, there is a rare generous spirit in force here, a sharp distinction to what obtains on the Lagos mainland, where the pressures of daily living have stripped nearly everybody of the simple courtesies of greeting and relating with the next person. As it happens I miss the Baale’s house, but retrace my steps with the guidance of other residents, only to learn that the man I seek is away attending a burial ceremony. So I walk back, past the kind stranger with the bread, and make a right turn towards Tarkwa Bay beach, which is five minutes away. And the first thing I notice, besides the soothing ambience, are dozens of eye-catching recliner seats lined up in a straight line some 25 metres from the shoreline. ‘We collect N200 for one’, the chap in charge says as we make our way to the shoreline. I will certainly need to sit in one, but not immediately. Except for a few surfers and strollers, the beach is deserted. A breeze blows gently in the air and the waters are tame. Far in the distance, there is nothing to see—just a seemingly endless stretch of the Atlantic. A banner positioned within sight describes Tarkwa Bay beach as ‘The safest beach in Nigeria’. So how is it that a beach this cute, and supposedly safe is empty—at 2pm? 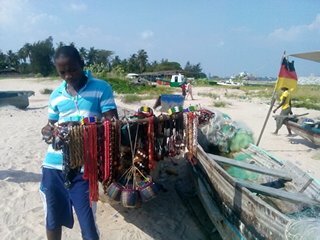 ‘Most people come here on Sundays’, Lanre, a member of the Beach Management Committee, tells me when we get talking. ‘Even today, you will see a crowd soon. It is still too early’. I’m impressed with the idea of a beach management committee. It is novel even. Aside from the private beaches which have devised ways to keep their heads above water, not once have I heard anything like this on most other community-based beaches in Lagos. According to Lanre, the committee was set up by the local government to ensure steady revenue, to help keep the beach in good shape. It appears the committee is barely able to meet its obligations, especially as per the necessary crowd-pulling facilities. A large track of the beach is clean, but there are patches of filth around and about, and a wide area in a corner serves as a dumping ground for the garbage generated by beach users. ‘We used to have Lagos State Waste Management (LAWMA) disposal vessels come here regularly through the waterways to pack the dirt, but all of a sudden they stopped coming. That is why the refuse is piling up ’, Lanre says. Some weeks before my trip to Tarkwa Bay, I had an opportunity to interview Disun Holloway, the Lagos State Commissioner for Tourism and Intergovernmental Relations, inside the Family Park (a new leisure facility) within the Lekki Conservation Centre that is soon to open to the public. I asked him about the ministry’s overall plans for tourism development as well as for beaches in Lagos, seeing that nothing remarkable has been done in the past decade to make them more appealing to tourists. 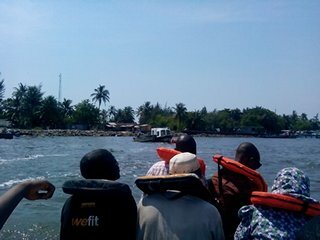 ‘Lagos State has approximately 180km of beach line. We’ve selected some beaches along this axis, and we are approaching His Excellency, Governor Babatunde Raji Fashola, with a proposal to harmonise the way that many of them are being run. At the moment, some of these beaches are managed by families who claim they own the land, others by private concerns. 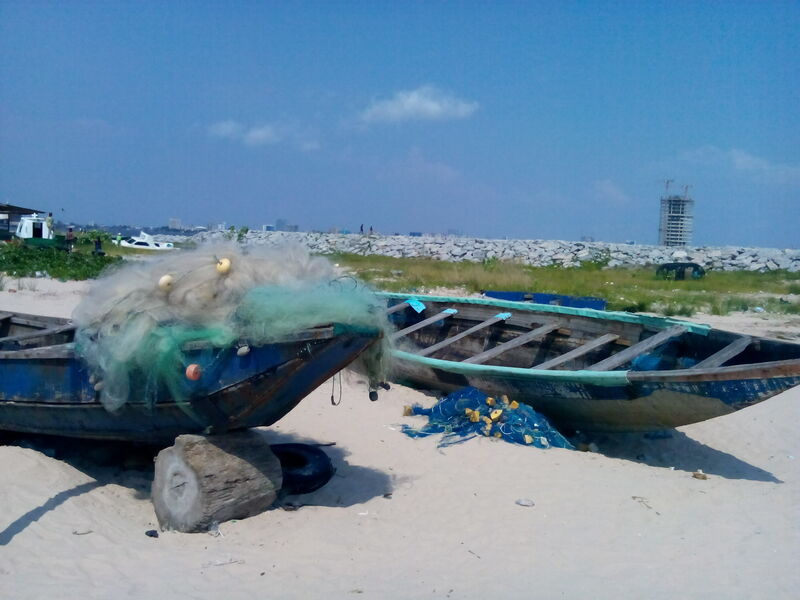 These facilities—and a grass cutting machine—are exactly what Tarkwa Bay beach also needs to raise its appeal with beach lovers, and to complement the efforts of the local committee.